Samford University professors Steve Donaldson and Josh Reeves have published a new book on science and religion, the latest in a series from publisher InterVarsity Press, a division of InterVarsity Christian Fellowship. 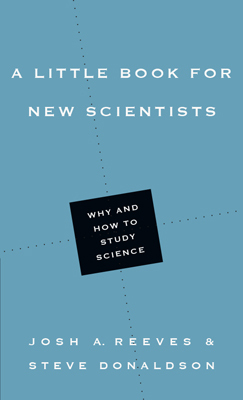 In their collaboration, A Little Book for New Scientists: Why and How to Study Science, the pair describes the essential role Christian scientists have in bridging the gap between science and Christian belief. Donaldson leads Samford’s computer science program, codirects the computational biology program and cofounded the university’s Center for Science and Religion. He was one of only 25 international scholars chosen to take part in the Bridging the Two Cultures of Science and the Humanities project in Oxford, England, 2015–16. His previous writing on the subject of science and religion includes the 2015 book Dimensions of Faith: Understanding Faith through the Lens of Science and Religion. Before joining Samford’s faculty as assistant professor of science and religion, Reeves managed the Center for Science and Religion’s New Directions in Science and Religion project, which brings constructive science and religion dialogue into the church. • Why should Christians study science? • Is it possible to reconcile science and Christian faith? • Does science contradict what God teaches in Scripture? • What are principles for interpreting Scripture passages that seem in conflict with scientific findings? • What is the historical relationship between science and Christianity? • Why do we view science as secular and in ongoing conflict with Christianity? • Why is it important for Christians to be involved in addressing the ethical questions raised by science? • What are some common sources of hardship for scientists, and what’s the best way to face them? • What is it like to be a Christian in the scientific community? • How do I maintain intellectual humility in my work? • Are all scientists atheists? • What are the characteristics of faithful science and scientists? • What unique role does the Christian scientist have in the church and scientific community? Samford’s Center for Science and Religion continues to explore these and other questions through public lectures, workshops, a reading group and a new, church-based education program announced in August. The center’s fall events include speakers Justin Barret and Ian Hutchinson.